CBS is saving MacGyver. Today, the network announced they’ve given a full season order to the reboot series. 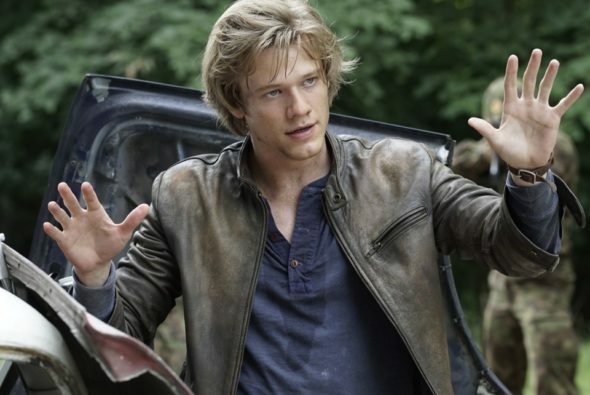 Based on the ’80s action drama, the show stars Lucas Till as a young Angus MacGyver, a government agent who uses his unique problem-solving skills to save people’s lives. The cast also includes George Eads, Sandrine Holt, Tristin Mays, and Justin Hires. Though MacGyver‘s ratings have declined a little since its premiere in September, the show still brings in strong numbers. Four episodes in, the drama has received an average of 1.30 in the 18-49 demo and 8.890 million viewers. In addition to MacGyver, CBS has also given a full season order to Kevin Can Wait and Bull. CBS has given full season orders to three top rated new series, including the #1 and #2 new series, BULL and KEVIN CAN WAIT, and Friday’s #1 new series, MACGYVER. The three shows, along with the Network’s returning hit programs, have helped CBS win the first three weeks of the season for the eighth consecutive year. In addition, all three have improved their time period, compared to a year ago. BULL, the #1 new program of the season, is averaging 17.32 million viewers, 2.6/09 in adults 18-49 and 3.8/11 in adults 25-54. BULL has improved the year ago Tuesday (9:00-10:00 PM) time period by +18% in viewers, +24% in adults 18-49 and +23% in adults 25-54. KEVIN CAN WAIT, the season’s #1 new comedy in viewers and key demographics, is averaging 11.26 million viewers, 2.8/09 in adults 18-49 and 4.0/11 in adults 25-54 on Mondays (8:30-9:00 PM). Compared to the year ago time period, KEVIN CAN WAIT is up +10% in viewers, +17% in adults 18-49 and +14% in adults 25-54. MACGYVER, Friday’s #1 new program, is averaging 11.35 million viewers, 1.9/08 in adults 18-49 and 2.7/10 in adults 25-54, winning its (8:00-9:00 PM) time period in all these measures. MACGYVER is up +55% in viewers, +12% in adults 18-49 and +17% in adults 25-54 compared to the year ago time period. BULL stars Michael Weatherly, Freddy Rodriguez, Geneva Carr, Jaime Lee Kirschner, Annabelle Attanasio and Chris Jackson. Mark Goffman, Paul Attanasio, Dr. Phil McGraw, Steven Spielberg, Justin Falvey, Darryl Frank and Jay McGraw are executive producers for CBS Television Studios. KEVIN CAN WAIT stars Kevin James, Erinn Hayes, Taylor Spreitler, Mary-Charles Jones, James DiGiacomo, Ryan Cartwright, Lenny Venito, Gary Valentine and Leonard Earl Howze. Kevin James, Bruce Helford, Rock Reuben, Jeff Sussman, Andy Fickman and Tony Sheehan are executive producers for CBS Television Studios in association with Sony Pictures Television. On Oct. 24, KEVIN CAN WAIT moves to its new regular time period on Mondays (8:00-8:30 PM, ET/PT), leading into the series premiere of MAN WITH A PLAN (8:30-9:00 PM, ET/PT). What do you think? Are you watching MacGyver? How does it compare to the original series? More about: CBS TV shows: canceled or renewed?, MacGyver (2016), MacGyver (2016): canceled or renewed? Thank Love macgyver!!! It brings me back to original many years ago. Love the actors and new ways of getting out of troubles!!! Please don’t cancel this great Friday night program. It’s terrific!!!! I didn’t know at first how I would feel about a new MacGyver. I love my original MacGyver, but I do believe in giving new shows a chance. I’m so glad I did. I love the new show. The cast is amazing and I look forward to seeing them on my dvr when I get home from work. I love Jack more now then I did back then. The character Jack isn’t causing MacGyver to get him out of trouble. He is MacGyvers teammate and has his back no matter what. I love Mcgyver please don’t cancel it. Please keep Macgyver it’s a great refreshing show. I absolutely look forward to the new MacGyver every Friday evening… It is a great addition to Hawaii Five-O and Blue Bloods… CBS has a real winner with this series and I very much like how George Eads compliments Lucas Till… They have great chemistry together and the show is very compelling and has lots of action which keeps me watching… The writing is very good and is very appealing to a male audience. Keep up the great Scripts… I will continue to watch. Love the show it does remind me of the original. I even loved how you brought Merdoct. Now if you can bring in Harry I think you would have a winner. Let there be a second season!